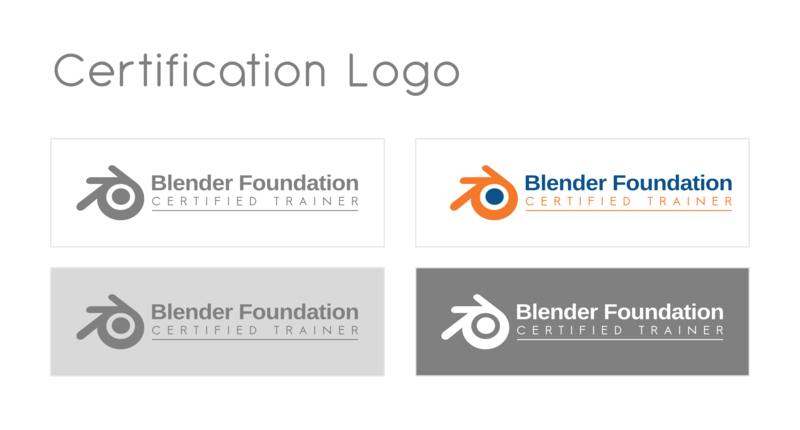 Aditia's versions are very cool, with only 1 remark: I think the text "Certified Trainer" should be more prominent and easier to read. It's much more important than Blender Foundation. I couldn't edit the text in his svg - it's probably not a font. Would aditia have time to check? > @ Piotr Not sure if this is what you missed, but Ton said this :"It's just better to take a step back and check on why you would need a unique identity for a certification program. I would think most people want the certification because it has an official status. It's stronger to use the official brand then." > I really like the logo as well, but I do agree with Ton in that it would be stronger to go ahead and use the same logo, so then when people see it the will know it has something to do with blender. > Hey, it seems that the subject is stopped or I missed some emails, from this list. So, what is the current status of Ton's proposal and the BFCT logo? > It's just better to take a step back and check on why you would need a unique identity for a certification program. I would think most people want the certification because it has an official status. It's stronger to use the official brand then.